When most people hear the phrase “green photonics” they immediately think of green laser pointers. However, green photonics is more than just laser beams with wavelengths between 500 and 550 nm. The threat to our energy supply posed by the exhaustion of fossil fuels requires renewed innovation in the development of technologies that can sustain our current technologically driven lifestyles. Photonics technologies are set to play an increasingly important role in this area and are already at the forefront of many global initiatives, from fundamental research in photovoltaic materials for solar energy capture to the development of innovative low-power lighting. 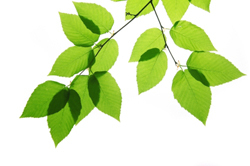 At Semrock we are becoming increasingly involved in this “green” revolution, partnering with research laboratories and manufacturers alike to provide them with best-in-class optical filters that meet the demands of their research and development. One key area where Semrock plays a key role is presented below: solar cell inspection. The ultimate goal in light-harvesting technologies such as solar cells is to collect as much sunlight as possible and to efficiently convert this light into useful electricity. Developing high conversion efficiency solar cells based on silicon is at the heart of current photovoltaic (PV) technologies. To achieve higher conversion efficiencies requires highly crystalline, defect-free and strain-free silicon films/layers. However, equally challenging is employing a reliable and quantitative analytical tool to monitor and understand how silicon materials perform post-manufacture. Raman spectroscopy is one such tool that is widely used in the solar cell industry to monitor the quality of silicon manufactured for PV cells. Understanding material crystallinity is critical for the manufacture of solar cells from monocrystalline silicon, as the presence of non-crystalline silicon leads to reduced conversion efficiency. Raman spectroscopy is an excellent tool for distinguishing and quantifying cyrstallinity in silicon. In crystalline silicon the bond angles, bond strength and bond energy are very uniform and ordered. As result highly crystalline silicon has very sharp peaks, such as the one centered at ~ 520 cm-1. In non-crystalline (i.e., amorphous) silicon the bond angles, bond strength and bond energy vary leading to broad diffuse spectral features around 480 cm-1. 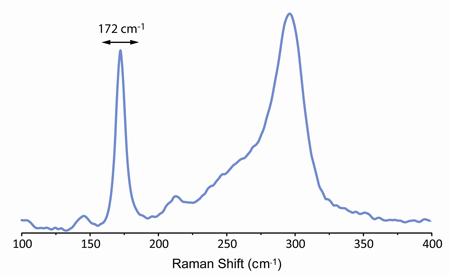 From Raman measurements it is possible to build a quantitative picture of the crystalline fraction from a ratio of the Raman peak intensities, I520/I480. Figure 1: Understanding crystallinity is in silicon: Raman spectra measured from regions of a silicon sample revealing the presence of highly-crystalline (orange) and non-crystalline (green, cyan, red) material. Data courtesy of Thermo Fisher Scientific, www.thermo.com/dxr. The ability to quantify both thermal and interfacial stress in solar cell materials is critical. Stress can dramatically impact conversion efficiencies in PV cells. Therefore, it is critical to understand where stresses are located, how they impact cell performance and ultimately how they can be controlled to improve process yields. Raman spectroscopy provides a direct measurement of stress (or strain) in silicon based solar cells by monitoring the spectral position of the 520 cm-1 peak on the sample, from which a stress map can be generated with sub-micrometer spatial resolution. As result Raman spectroscopy provides direct insight into solar cell processing and prevents less efficient cells from leaving production. 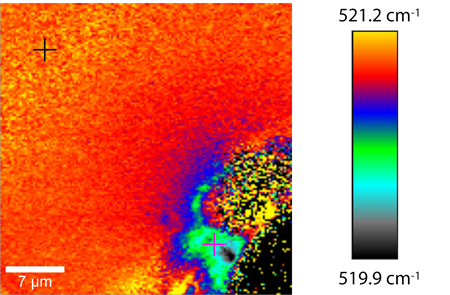 Figure 2: Mapping stress in silicon: A stress map generated by monitoring the position of the Raman peak centered at ~520 cm-1 from a laser drilled hole in a silicon wafer. As a result engineers can evaluate the exact drilling parameters that will produce the lowest stress and maintain high conversion efficiencies. Image courtesy of WITec GmbH, www.witec.de. Alternative and highly researched materials for solar cells are silicon carbide, and copper indium gallium diselenide, or CIGS. Given that CGIS is an alloy, it can be manufactured with varying blends of each individual component. High-performance Raman spectroscopy using filters with steep edges and small transition widths allows one to detect low-energy vibrational modes that lie much closer (< 190 cm-1) to the laser line than the 520 cm-1 peak from silicon. By monitoring the Raman peak around 172 cm-1 it is possible to quantitate the indium and gallium concentrations and generate alloy heterogeneity maps across the CIGS film. Figure 3: Raman spectroscopy of alternative solar materials: Raman spectroscopy using high-performance edge filters can be used to precisely monitor the indium and gallium alloy composition in copper indium gallium diselenide (CIGS) solar cell films. Data courtesy of Thermo Fisher Scientific, www.thermo.com/dxr.